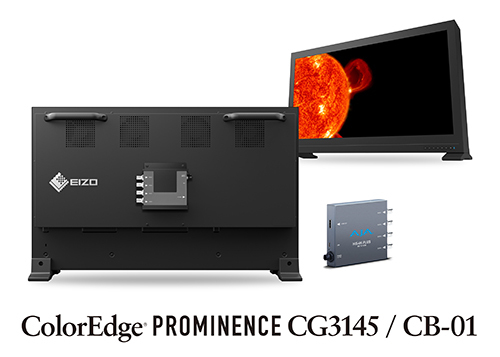 Hakusan, Japan, April 4, 2019 – EIZO Corporation (TSE: 6737) today announced the CB-01 – an optional mounting bracket for the ColorEdge PROMINENCE CG3145 HDR reference monitor that allows the attachment of the AJA Hi5-4K-Plus SDI to HDMI converter. The ColorEdge PROMINENCE CG3145 is EIZO’s 4K HDR reference monitor featuring HLG (hybrid log-gamma) and the PQ (perceptual quantization) curve for HDR video creation. The monitor has been tested for compatibility with AJA’s Hi5-4K-Plus SDI to HDMI converter, so users can reliably equip the monitor for SDI connectivity. Keeping a clean workspace in mind, EIZO designed the CB-01 SDI converter bracket specifically to attach the AJA converter directly to the back of the monitor. This provides simple SDI connection and keeps cabling controlled and out of sight. Furthermore, the ColorEdge PROMINENCE CG3145 (S/N 3xxxxxxx or later) powers the Hi5-4K-Plus, eliminating the need for the power adapter that comes with the converter. Working closely with technology providers in the media & entertainment industry allows EIZO to continue to provide solutions that meet customer needs. Assured technical compatibility and options for ease of installation ensures customers are provided with a reliable solution that takes into consideration both usability and workspace aesthetic. The CB-01 is now shipping. Date of availability varies by country so contact the EIZO group company or distributor in your country for details. Since 1993, AJA Video has been a leading manufacturer of video interface technologies, converters, digital video recording solutions and professional cameras, bringing high-quality, cost-effective products to the professional broadcast, video and post production markets. AJA products are designed and manufactured at our facilities in Grass Valley, California, and sold through an extensive sales channel of resellers and systems integrators around the world. For further information, please see www.aja.com. EIZO, the EIZO logo, and ColorEdge are registered trademarks of EIZO Corporation in Japan and other countries. AJA is a registered trademark of AJA Video Systems, Inc.